Manchester United are working on a deal to beat Manchester City and Juventus to the transfer of Wolves midfielder Ruben Neves in the upcoming January transfer window. The Portugal international is regarded as one of Europe’s top young midfielders at the moment, having shone in both the Championship and Premier League with current club Wolves. Tuttosport are talking up growing interest from Juventus in Neves’ signature, but it’s understood he’s also a top priority for United this January. The Sun strongly linked the Red Devils with the talented 21-year-old earlier this season, and it now seems the club could launch a bid of around £60million for him in the coming weeks. Naves is represented by super-agent Jorge Mendes, who has strong ties with United due to also representing manager Jose Mourinho and goalkeeper David de Gea. 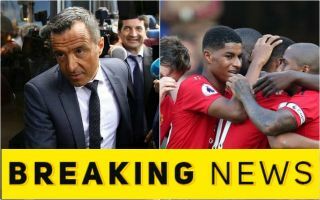 This could give MUFC some edge in the transfer battle, while there’s also been talk of the unsettled Marcus Rashford moving to Wolves as part of the deal. The young forward is attracting plenty of interest at the moment as there’s growing talk of him being unsettled due to a lack of regular playing time at Old Trafford. Bigger names like Real Madrid have been surprisingly linked with the England international, but it’s understood he’d favour remaining in the Premier League and guaranteeing himself more playing time anyway.